Tito the Mighty HunterHe came to me roundabout, first from the neglectful neighbors who named him, then from death row at the dog pound. 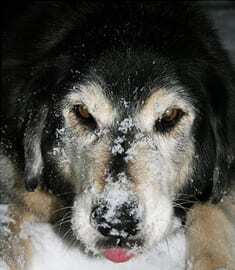 I didn’t need an energetic malamute-black lab cast-off mutt; I adopted him only to save his life. Overshadowed by my older dog-friend, he was in my life for a year before I began to realize how extraordinary he was. We went for a run every day, romping through the heart of the world together. We hiked along crystal creeks and across mountain meadows in California. Trotting by my side, Tito met deer and elk in Arizona. He dug for chipmunks and swam in lakes in Upstate New York. He discovered crabs on the beach in Maine, tapping them with his foot and looking quizzically up at me: “Hey, they bite back! What ARE these things?” On winter mornings, he snoozled luxuriously in the snow, skating nose-first down my backyard hill, rising to shake rainbows of ice crystals into the sunlight. A natural leg-leaner, he charmed everyone he happened across. I know I can’t have HIM again, but if I could have his puppy-twin …? Yeah, I could live with that.